As part of the process of exhibiting images from manuscripts, documents, and other written materials — for example in our Galleries of Scripts and Texts on Parade and in our reports on Manuscript Studies — we offer a Report on ‘Two Detached Manuscript Leaves containing New Testament Texts in Old Armenian’ by our Associate, Leslie J. French. 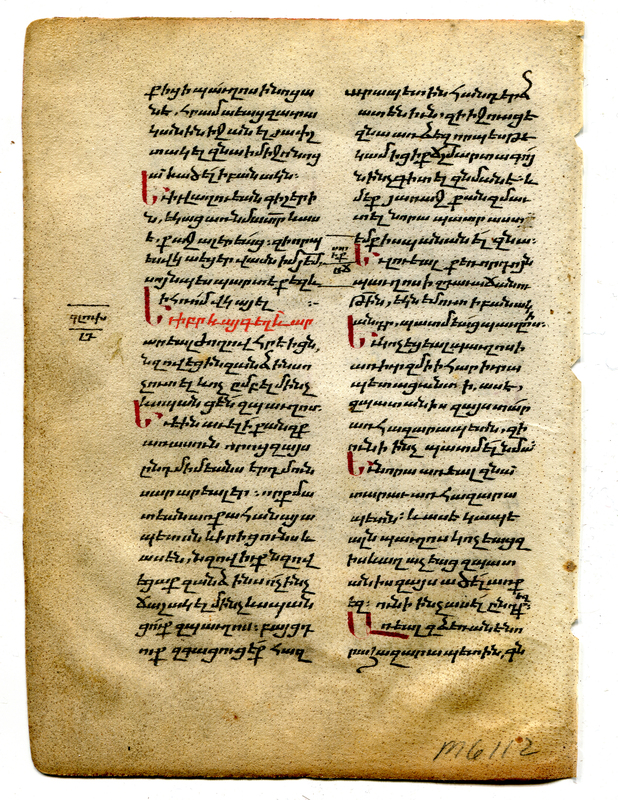 Two detached leaves, purchased separately from two different sellers in the United States, and now in a private collection, can be identified as part of a manuscript of the New Testament in Old Armenian for which some other leaves are known. Among them is MS 773 (likewise a detached leaf) in the Goodspeed Manuscript Collection at the University of Chicago. That leaf, known as the Ananias Fragment, contains part of the Acts of the Apostles, plus a prayer. We show both recto and verso of the 2 New Leaves, newly identified as containing respectively portions of the Acts of the Apostles and Paul’s Epistle to the Romans. A report about them will follow. Old Armenian New Testament fragment in bologir script, folio II recto in Romans. Reproduced by permission. Armenian New Testament fragment in bologir script, folio II verso in Romans. Reproduced by permission.